Wednesday, November 4th, 2015 at 10:59am. 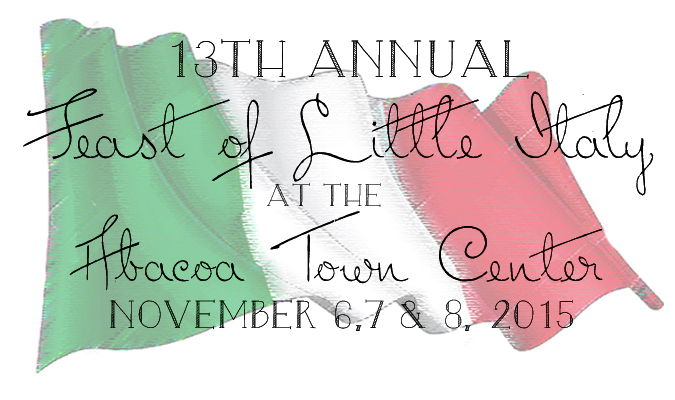 Make sure to mark your calendars for a weekend of Italian culture, cuisine and celebration at the 13th Annual Feast of Little Italy at the Abacoa Town Center in Jupiter. This fun and festive event gives guests a feeling of warmth and welcome with the best of Italian art, music, and literature. The Feast of Little Italy lines the streets of Abacoa’s Town Center with over 140 vendors, live music and beautiful décor. Some of the live music you will feasting your eyes and ears on includes, Grammy & Oscar Nominated artist, Frank Stallone, the three women’s harmony group, Tre Bella and so many more Italian inspired artists.